SAN JOSE, California, May 2, 2012 (ENS) – The popular online auction site eBay, has just opened Green Driving, a new section of the site offering hybrid and electric vehicles and and their parts. The Green Driving site is designed to help drivers determine how best to green their daily routines, including information on electric vehicles, hybrids, clean diesels, compressed natural gas and ethanol vehicles, as well as high-mpg gasoline vehicles. “eBay Green Driving combines tools and resources, as well as eBay’s unique green vehicle and parts inventory, into one comprehensive, informative, and idea-rich shopping experience,” wrote Sanghvi. To build excitement, eBay Green Driving is offering the chance to win a new 2012 Toyota Prius, courtesy of AutoNation, the largest auto retailer in the United States. To win, visitors accumulate points by going to the Green Driving website at: http://green.ebay.com/green-driving/tips/. There they share green driving tips found on the site with friends via Twitter, Facebook and Google+ and getting them to click on a link to the contest page. The grand prize winner of the Prius will be selected on May 15, 2012. 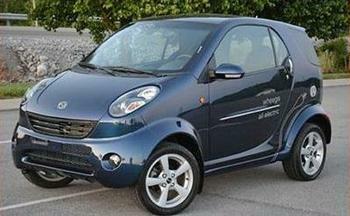 Electric vehicles on auction today include a 2010 Wheelgo in Nashville, Tennessee. This car sold new for $22,000 and they current bid stands at $5,105 with five days to go in the auction. Also on auction is a 2002 Ford Think in St. Petersburg, Florida with just 115 miles on it, new batteries and a one year warranty. Current bid is $799 and the little two-seater would sell for $3,900 if someone took it out of the auction by buying it outright. The Green Driving auctions offer plenty of electric bikes and golf carts for low bid prices. On the high end of the spectrum, the bidding is hot for a 2012 Fisker Karma EcoSport electric hybrid being auctioned by a dealer in Utah. The current bid on the EcoSport is $95,600, but the reserve bid has not yet been met and bidding closes on May 3. A little more affordable is a 2012 Mitsubishi i-MiEV SE Cool Silver Metallic with a “Buy it Now” price of $24,500, about $10,000 less than the manufacturers suggested retail price. Located in Burbank, California, this i-MiEV is being auctioned off by a company that was once in the EV charging station business. The electric car was driven to the offices of potential customers to demonstrate the charging machines and has just 1,345 miles on it. “This site combines informative content with our extensive parts and vehicles inventory to address the growing trend towards fuel efficiency,” said Gregory Boutte, vice president of eBay Motors and Electronics in North America.